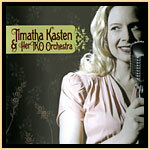 The New York City based TKO orchestra will knock your socks off! "TKO" is for "Total Knock Outs." Performing sophisticated American standards and a few Latin dance songs, Timatha and Her TKO Orchestra offer an exceptional evening of swing and classic music in the style of Ella Fitzgerald, Count Basie, and Tito Puente. Typically a 17 piece big band, they can have as many as 19 members when they add their timbale and conga players for some spicy Latin music.